Raised in the city of Stoke-on-Trent in western England, Saul Hudson was given an immediate introduction to the entertainment industry through his parents: his Nigerian mother being a clothing designer (with clients that included David Bowie and The Pointer Sisters) and his Anglo-Jewish father working as an art director for Geffen Records (with clients such as Neil Young and Joni Mitchell). At the age of eleven Saul was moved by his mother to Los Angeles, where his exposure to show business became a matter of daily course; his father later reunited with the family, but the couple ultimately separated once again and for a time young Saul was placed in the care of his grandmother. It would be his grandmother that provided Saul with his first guitar, and, despite having only one string, the second-hand acoustic was compelling enough to divert the then 15-year-old away from a budding career as a professional BMX competitor. All of his time was soon being devoted to practicing on the instrument, with schoolwork and other interests falling by the wayside. By the 11th grade Saul had dropped out of high school to pursue music full-time, performing with a long series of short-lived local bands; an unsuccessful attempt to join the hair metal combo Poison was made by the guitarist -- now calling himself "Slash" -- during this time (perhaps he chose the wrong shade of lipstick for the audition? ), followed by the creation of the band Road Crew with drummer Steven Adler. Road Crew had difficulty maintaining a stable line-up, and the pair eventually merged with Axl Rose's band Hollywood Rose, becoming Guns n' Roses in 1985. The popularity of Guns 'N' Roses spread reasonably quickly, and a deal was soon arranged with the label for which Slash's father had worked, Geffen Records. After a phony "live" EP titled Live ?! *@ Like a Suicide (issued under the UZI Suicide imprint at the end of 1986) the band's first full-length effort Appetite for Destruction was released in summer of 1987, filled with songs about personal excess and sporting a provocative Robert Williams painting on its cover. In it's first year the album managed only moderate sales due to an MTV ban supposedly motivated by an objection to this cover image; the design was subsequently changed and the appropriate asses kissed, after which rotation of the video for Welcome to the Jungle launched the album to the top of the charts and its sales into the eight-figure realm. In the years following their rise to fame, the members of Guns 'N' Roses maintained media attention on themselves as much through drunken public displays and ego clashes as through their musical output. A second release, G N' R Lies (1988), collected the Suicide EP with a four new acoustic songs, somewhat filling in the gap before the two-volume set Use Your Illusion I and Use Your Illusion II finally materialized in 1991. Critical response was significantly more reserved for these two releases, but audience support remained strong, and both found their way high into the US charts (#2 and #1 positions, respectively). In the midst of this success, conflicts between Slash, Adler and Rose worsened as a result of the singer's objection to the heroin use of the other two; Slash managed to overcome his addiction in 1991, but Adler continued in his drug use and was subsequently ejected from the line-up. 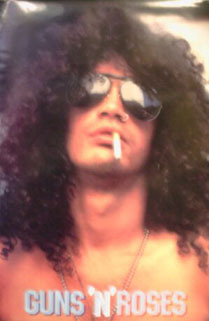 Throughout his involvement with Guns 'N' Roses, Slash remained active outside of band sessions and tours as a guest player for other artists, his various appearances ranging amongst performers as diverse as Iggy Pop, Bob Dylan, Alice Cooper, Michael Jackson, Motorhead and Carole King. After another studio release in 1993 (the covers collection The Spaghetti Incident?) Guns 'N' Roses entered a period of suspended activity, at which time Slash initiated the side project Slash's Snakepit; bandmates Gilby Clarke and Matt Sorum were also involved, as well as Alice in Chains bassist Mike Inez and former Jellyfish guitarist Eric Dover. The band's debut album It's Five O'Clock Somewhere emerged in 1995, followed by a 6 month tour with a slightly altered line-up. Upon the conclusion of the tour Snakepit was dissolved, but further work with Guns 'N' Roses remained hopelessly stalled due to "creative differences" between Slash and Axl Rose: the singer wanting to move the band's sound in a more "industrial"/electronic direction, while the guitarist preferred to keep things rooted in a conventional rock vein (many of the songs for Snakepit had been his ideas for new Guns 'N' Roses material, all of them rejected by Rose). In 1996 Slash finally gave up on any compromise being reached and announced his resignation. That year he organized the new project Slash's Blues Ball, a short-lived blues cover band originally assembled to perform at a festival in Budapest; his occasional guest appearances continued throughout the remainder of the decade (on records for Insane Clown Posse and Sammy Hagar, amongst others) and in 1999 he re-formed Snakepit with an entirely new group of musicians. A second album, Ain't Life Grand, was released in 2000, but shortly after the associated tour the guitarist lost interest and dissolved the band a second time. In 2001 the guitarist began developing plans to launch a solo career, but was unexpectedly sidetracked from this idea by the promising results of a reunion with old bandmates Matt Sorum and Duff McKagan. Ex-Loaded/Wasted Youth guitarist Dave Kushner was soon brought into the line-up, and -- following a series of televised auditions broadcast by VH1 -- former Stone Temple Pilots frontman Scott Weiland was chosen as a lead singer. The new band, dubbed Velvet Revolver, issued its debut recording for the soundtrack of the Ang Lee film The Hulk in 2003, contributing the song Set Me Free. A cover version of Pink Floyd's Money was subsequently featured in a remake of The Italian Job (also 2003). Velvet Revolver's first full-length release Contraband was released the following summer and immediately positioned itself at the top of the mainstream charts. In 2005 the band revisited the comic book setting of its first song with a contribution to the Fantastic Four soundtrack.